Located in Costera Acapulco, this hotel is within a 10-minute walk of Naval History Museum and El Rollo Acapulco. El Revolcadero is 6.3 mi (10.2 km) away. First time in this hotel and we’ll return in another vacations. Where to find Acapulco hotels near an airport? How can I find hotels in different Acapulco neighborhoods? Where can I find hotels in Acapulco that are near tourist attractions? Staying in Acapulco? There's a wide range of accommodation options for travelers to choose from. On Expedia's handy booking section you can browse 57 hotels within a 0.1-kilometre (0.06-mile) radius of Acapulco's heart. 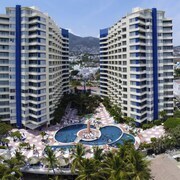 Acapulco offers travelers a number of centrally located places to stay, such as the Ramada Acapulco and Hotel Oviedo Acapulco. Visitors who are after a popular neighborhood in which to stay, should check out Acapulco Tradicional. It is 0.9 kilometres (0.6 miles) from the middle of Acapulco. There are 7 Expedia accommodation options in the neighborhood. 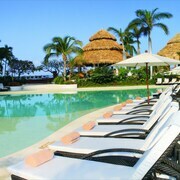 Amongst the more popular of the hotel options in this area are the Hotel Boca Chica Acapulco and Alba Suites Acapulco. Alternative accommodation neighborhoods include Pie de la Cuesta and Icacos. The Hotel BaXar and Hotel Quinta Karla are in Pie de la Cuesta, while Icacos is where you'll find the Grand Hotel Acapulco and Hotel Nilo. Punta Diamante is 9 kilometres (6 miles) from Acapulco's downtown, while El Marques is 12 kilometres (7 miles) from downtown Acapulco. The Banyan Tree Cabo Marques and Quinta Real Acapulco are situated in Punta Diamante, while Hotel Olinalá Diamante and Villamar Princesa Suites are located in El Marques. The La Quebrada Cliffs is amongst the more well-known attractions in Acapulco. The Ritz Acapulco Hotel de Playa All Inclusive and Krystal Beach Acapulco, are all within easy walking distance of La Quebrada Cliffs. The Bahia de Puerto Marques and the Magico Mundo Marino also have some hotels nearby. The Encanto Acapulco and the Camino Real Acapulco Diamante are among the hotels that are close to the Bahia de Puerto Marques. 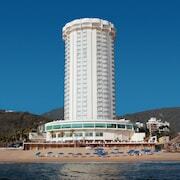 The El Mirador Acapulco and the Hotel Aristos Acapulco are closer to the Magico Mundo Marino. If you have very few wishes and are hoping to find slightly lower priced Acapulco accommodations, there are also plenty of economy hotels to choose from in the area. 4 kilometres (2 miles) from Acapulco's downtown area you'll find the Fiesta Americana Villas Acapulco. The Hotel BaXar is only 9 kilometres (6 miles) away. 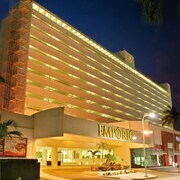 The Hotel Emporio Acapulco and the Hotel El Presidente Acapulco are two alternative cheaper hotels that you could consider. 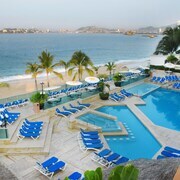 5 kilometres (3 miles) away from downtown Acapulco, is the Park Royal Acapulco All Inclusive Family Beach Resort. Alternatively, the Casa Yalma Kaan Sensor is positioned 30 kilometres (19 miles) away. 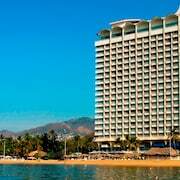 The Ocean Breeze Acapulco and also the Holiday Inn Acapulco La Isla are other alternative places to book accommodation around Acapulco. 8 kilometres (5 miles) from Acapulco is Puerto Marques, where you can spend the day exploring Capilla Del Atardecer and Playa Majahua. If you'd like to visit Puerto Marques, check Expedia's booking pages for the latest deals at the Casa Inn Hotel Acapulco and One Acapulco Costera. 4 kilometres (2 miles) to the east of Acapulco, is Zona Dorada, home to the Holiday Inn Resort Acapulco and Copacabana Beach Hotel Acapulco. Whether you're just passing through or staying in Zona Dorada, a couple of places to add to your itinerary are the Acapulco International Center and Acapulco Golf Club. Situated 18 kilometres (11 miles) from Acapulco is General Juan N. Alvarez International Airport. Stay nearby at Club Piedras De Sol Acapulco Diamante or Resort Mundo Imperial. What are the most popular Acapulco hotels? Are there hotels in other cities near Acapulco? What other types of accommodations are available in Acapulco? 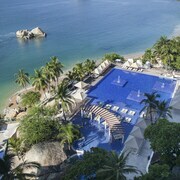 Explore Acapulco with Expedia.ca’s Travel Guides to find the best flights, cars, holiday packages and more!